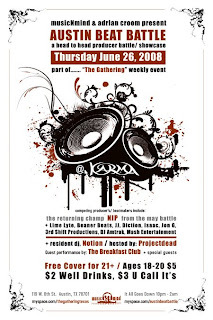 From the marriage made in heaven department... Austin Beat Battle, a head to head producer battle, and The Gathering cook it up again @ Karma Lounge on June 26th, tomorrow night! Also guest performances by The Breakfast Club Crew. Watching a piece on internet pharmacies and the ease of buying prescription drugs online. Abuse of prescription drugs is even more pervasive than illegal drugs can you digg. Gotta make you snicker at all those anti-drug weenies. Free the sticky-icky!